The season is finally at our doorstep - yay! But wait, all those projects you thought you were going to do last season - are they still not done? For instance, our Master Bath cried for a renovation. However, I am so busy helping my clients with their renovations, I have little time to spare. But making our first appointment with the contractor, my plumber and my tile installer, put us at the starting gate to get things going. Now that our Master Bath is done, our Master Bedroom is next on our list. Our ONE thing that needs to be changed is the paint color. I'll keep you posted with what I have in mind, but for now, I've got to go and do the ONE thing on my exercise list for today. Need a 'Brush-up on selecting the perfect Paint Color? Color is a hot topic nowadays. From Pinterest to Houzz and HGTV to Facebook, everyone is talking about a particular room they saw and loved - and the color that was used on the walls. It sounds so easy. Just point and click. 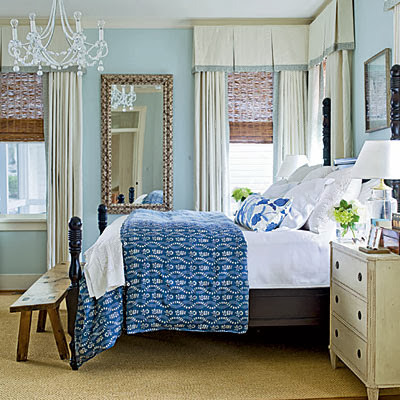 Use that blue that a designer chose at a designer showhouse featured in Traditional Home magazine. Or, follow the lead and paint your walls that 'shade of gray' you loved in Elle Décor. The problem is that it doesn't translate as well in real life. Your home has different light than the home you saw in House Beautiful. Maybe your floors are dark and your wood furniture has a different stain color than the picture you so want to replicate. What do you do? Put down that color chip and go to your nearest paint store or call your favorite designer and choose a variety of tones in that shade of blue, for instance. You may need a warmer, grayer blue than the one in the magazine. Some colors appear reflective. Other shades may be more recessive. You may need a contrast in your room rather than a basketfull of neutrals that will put you to sleep. It will be trial and error. Sometimes it's easy and sometimes it takes a few go-arounds till you settle on the color of your dreams. Whatever you do, take your time. Understand that there is a color for you. It's just waiting for you to discover it and love it! Jersey Shore, New Jersey and Metropolitan NYC New Jersey. If you're like me, you are often (or always) thinking about updating your home. 1. Have a clear idea of how the space will be used. For instance, if you plan on entertaining more than before in a dining room, decide on the total number of dining chairs and table length you need. 2. Create a budget for the new furnishings. Dining tables can be anywhere from 'free' (used) to thousands of dollars. What your budget allows will be the starting point for where to source your new table. 3. Understand the elements of great design. When you see beautiful rooms in Pinterest or Houzz, they were created with the concepts of balance, proportion and scale. They were most likely created through a well-trained eye and/or a professional interior designer. 4. Know what decorating style suits your lifestyle best. Are you a traditionalist, a minimalist or a lover of mid-century design. There is much to choose from today in the furniture world. In the 'before' it was expected that if you were into a more traditional look, you would avoid contemporary furnishings. However, today it's acceptable to have a mix of traditional with contemporary furnishings. 5. 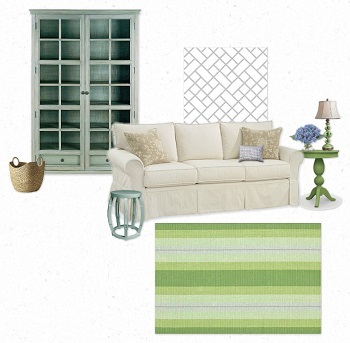 Plan a color scheme for your home. 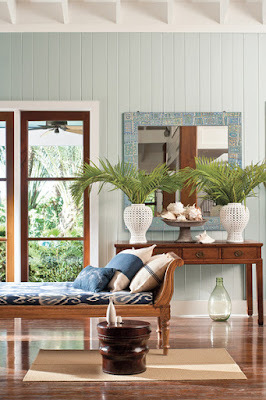 Try the idea of connecting rooms with one color that is repeated in the other rooms of your home. For instance, one room could have a blue-green color on the walls and the adjacent room could have a blue-green rug with soft white walls. Is Decorating Your Home Scary? Surprise! - you're in the right place! I know you have decisions to make, people to contact and budgets to stick to. Yes, all of that takes time. It will take time to meet with architects, contractors and interior designers to help you decide what to keep in your home and what will change. But, remember, if you take the time, you can eventually enjoy the good things in life - like your home! But you say "I hardly have time now!" Yes, that's true. It's all about small wins. Every small win makes my successful clients want to get to their next small win. And so it is with home renovations or decorating. You schedule meetings with your contractor and interior designer, the first important win. You discuss the project, another small win. Each day is a day to enjoy the feeling of getting your project off to a great start. Each day you will enjoy a small win or even many small wins. "Today I will have small wins, one or many" - it's your mantra, your day to get your project off to a great start! You probably have a favorite color, one of those colors that you are drawn to for your clothes or your home. You use it often because it makes you feel good and look good. But there’s a world of color out there and maybe it’s time to try or add a new hue to your repertoire. For instance, never in my wildest dreams, would I have thought of using gray in my home. I’m a lover of warm colors and even my home office/studio has red walls. Our Foyer and halls had a shade of beige that works well and is timeless. So, when shades of gray became popular for paint and furnishings, it first seemed to go against my love of warm colors. But since I’ve used gray for a number of my clients, I was open to the idea of using gray tiles in our Master Bath renovation. It’s been months now since our former tub area became one of my favorite places to start the day. The gray tiles and mosaics in our new shower have that ‘spa’ look that suggests a feeling of tranquility. Besides tranquility, I’ve found I love gray because it has that fresh, clean and updated look. Afraid of color? Try a touch of gray or a touch of another color that attracts, yet scares you. Add a touch of color with accessories, lamps, bedding, etc. It doesn't always mean painting walls a new color. Try a new color idea on for size first. By the way, what paint color have you been thinking of forever for your home? After Construction The Fun Begins! I will always remember the first day I stepped into my client's newly purchased home. It was very different from her home up north. This house was empty and visibly in need of renovation. The kitchen was dark and separated from the living room's view of the water's edge. The question was how could we change the dark rooms, the tattered walls and bring them into the light of day. To begin the process of renovation, we discussed the what-ifs to get a vision of where to go. After many discussions with the team made up of the client, myself, the contractor - the project started to come to life. But like many journeys, there were surprises and disappointments along the way during construction. Yes, the wall could be opened up, but the dining room had no place for a china cabinet. Luckily, we found space behind a wall in the dining room to build a built-in china cabinet. It took a few months to complete the project. The contractor had other commitments, things slowed down a bit, but all through the days, my client moved through the inevitable upheaval with a 'let's forge ahead' attitude. Change is hard for some. But, it's those who forge ahead every day and understand that it's a process when you are working on a renovation project. Many steps are needed to go from a dark and dated room to a bright and welcoming home. It's about saying 'yes' to change and yes to better days ahead. Mary Alice Smith of M. A. Smith Interior Design - an interior designer serving New Jersey, Ocean and Monmouth County, the Jersey Shore and metropolitan New York areas. Do You Need Help With Choosing Paint Colors For Your Home? How do you know if you need help with choosing paint colors for your home? If any of the situations below resonate with your present dilemma, maybe it's time for a little help from the experts. You have a bulging file of paint chips from your neighborhood paint stores that are now weeks, months or even years old. The topic of most of your conversations with friends or family about your home revolves around paint colors. There are enumerable samples painted on your walls and none seem to work just right. If you nodded your head to any of the above, take heart there is hope! Many of my clients were exactly where you are now. They want so badly to pick just the right color, but cannot find the answer and it's driving them crazy. Upon arriving at your home (during daylight is best), the designer will want to see your home to get a feel for the style of décor that you presently have. The designer will ask you questions and listen to what you have to say about your color preferences or dislikes. There will be a discussion about how you want to 'feel' in the space (For instance, relaxed or energized) with the new color. Concepts about color and the effects of color in a room will be discussed. The designer will take note of the present furnishings, flooring, lighting, etc. because they all affect how a color will look in a space. Armed with paint chips and sometimes paint sample boards, the designer will start to show you some sample colors, tints or shades to see your reaction (good or bad) for reference. After ruling out certain colors, you and the designer will begin to fine tune the selection. A selection may be made at that point, and the designer will record your selection with suggested finishes (flat, flat matte, satin, etc.) and leave you sample color chips. If you're still not sure - Your next step is to return to your paint store and order (yes, one more time) a quart or two of sample paint. With paint in hand, you should test the paint either on the wall, or my favorite - on a 20 x 30 piece of foam-core from Michaels, A. C. Moore or other art supply store. Of course, the designer may do the legwork on #10 and return with the painted sample boards in hand, if that works for you and your busy schedule. The beauty of the sample boards is that you can move them around the room and keep your walls neat and tidy till painting day. The whole point of working with a designer is to lay your fears, anxiety and worries to rest so you can enjoy your home as soon as possible. Still on the fence about what all this will cost in time or money? Look for my next blog post where we'll talk about how long it takes to get to the right color and how much it will cost to hire a designer. In the meantime, if you have a question about paint colors - please leave a comment and I will get back to you before you can say 'paint'! This could be your bathroom! First of all, the good news is that you are reading this post. You're reading it probably because you have all the intentions of giving your home a new look, but somehow nothing gets done. Life, home, family - everything is calling for your immediate attention. Plans to paint the rooms, find new sofas, rugs or revamp the 90's kitchen and baths are on hold. Days, weeks and months (maybe years) go by and nothing gets done. Even though I am an interior designer, I am faced with the same dilemma. Truly my clients projects are my first priority during the workweek. There's little time to spend on the updates that are calling for attention in my own home. So, you're wondering, how does this designer get out of the Analysis Paralysis roadblock? Create a floor plan to show if the shower area could replace the tub. Determine an approximate budget for the project. Go to resources like Artistic Tile or Waterworks or Avalon Tile and review tile selections. Select the tile and furnishings for the floor and walls. (Ok - I'm used to doing this for my clients, so it's easier for me. But I still had to do this). Go to my local cabinet shop with the tile sample and select the vanity. Return to the tile or fixture store and place the order the tile, grout, etc. What you may notice above is that I use steps to follow that make sense. First, I had to know that a shower could actually fit in the old tub space, before I got too excited about having a zen-like shower to enjoy at the start of my busy days. At some point, things will get done when you start the journey. I worked on the floor plan on one day. Another day, I visited the tile store. The point is that it takes action. Thinking about what you want to do is great, but nothing gets done unless you do something, anything! So, leave Analysis Paralysis behind - start today with just one small thing. Call a friend, call your Mom or call a designer to get the home you've always wanted, the home you deserve to enjoy. The Holidays are coming - it's time to get your decorating done! It's a puzzle. You've gone through this season for a number of years. You'd think by now you've got a system to keep it all in check - the shopping, the decorating. But, here you are again with a to-do list as long as a trip to the moon! I'm with you on that. But, lately I've found that if you just allow yourself to take a moment to think what your really have to do vs. what you think you are expected to do, your list will shrink immensely. Stay in the moment - it will keep you from thinking about the holiday rush. Just concentrate on what's in front of you today. Do what you can do today. Believe you already have what you want. For instance - you want a new paint color. So, instead of seeing yourself not there, see your room with the color you love. All in all, sometimes you just need a little help, encouragement and a coach. The favorite part of my job is helping my clients move their project along, giving them the support and encouragement they need.